Apparently this November has been the gloomiest in a while, and that certainly may have slowed down my on-going quest to bring arrow functions to V8. Though arrow functions deserve a write-up themselves, my musings today are about a side quest that started in September, when I had the chance to visit enchanting Berlin one more time, this time as a speaker at JSConf EU. Provided that the video of my talk at JSConf EU is now online, you may want to go watch it now (as an option, with the slides in another window) and come back afterwards to continue reading here. Did you see the video of the talk? Good, let's recap a bit before continuing. Most of the features introduced in the runtime library by the ES6 specification can be implemented without needing to touch low-level C++ code. Or do we? Live-coding, what could go wrong? At this point we have a working polyfill-style implementation patched in the prototypes of typed arrays, and it works. Yet, it does not quite work as it should. To begin with, the function should throw TypeError if called on an object that is not a typed array, or if the callback is not callable. The spec also mentions that the .length property of the function should be 1 (that is: it is declared as having a single argument), and so on. 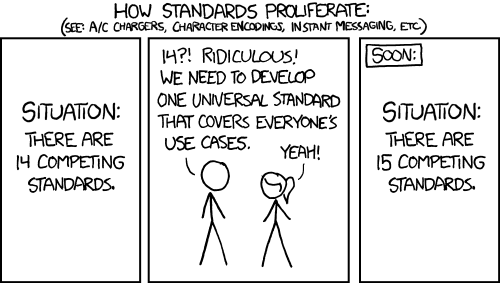 How standards are born, courtesy of XKCD. That leads to yet another subtlety: the value passed as thisArg (available as this in the callback function) is expected to be wrapped into an object only for sloppy mode functions — but not for strict mode ones, because strict mode is, well, stricter. While .call() handles this, it is not particularly fast (more on this later), so we may end up needing a way to know which functions are in sloppy mode, do the wrapping ourselves (when needed) and arrange the calls in a more efficient way. We have to assume that there will be code in the wild relying in this behavior. If only we could knew which functions are sloppy! To begin with, there is %_CallFunction(), which is used pervasively in the implementation of the runtime library instead of .call(). Using it is an order of magnitude faster, we will be keeping it in our utility belt. Then, there is %IsSloppyModeFunction(), which can be used to find out the “sloppyness” of our callback functions. But wait! Do you remeber that I mentioned macros above? Take a look at src/macros.py, go, now. Did you see something else interesting in there? Plenty of utility macros, used in the implementation of the runtime library, live there. We can use SHOULD_CREATE_WRAPPER() instead. Also, there are a number of utility functions in src/runtime.js, most annotated with sections of the EcmaScript specification because they do implement algorithms as written in the spec. Using those makes easier to make sure our functions follow all the intrincacies of the spec. // TypedArrayForEach.length==1 as per the spec. Now that is much closer to the version that went into V8 (which has better debugging support on top), and it covers every the corner cases in the spec. Rejoice! Needless to say, there is no documentation for most of the helper functions used to implement the runtime library. The best is to look around and see how functions similar to the one we want to implement are done, while keeping a copy of the spec around for reference. Do as the tigers do. Those are a couple of things one can find by scouring the the existing code of the runtime library. First: for typed arrays, the macro in SetupTypedArrays() installs a copy of the functions for each typed array kind, effectively duplicating the code. While this may seem gratuitious, each copy of the function is very likely to be used only on typed arrays in which elements are a certain type. This helps the compiler to generate better code for each of the types. Second: Runtime functions with the %_ prefix in their names (like %_CallFunction()) do not have their C++ counterpart in src/runtime/. Those are inline runtime functions, for which the code is emitted directly by the code generation phase of the compiler. They are real fast, use them whenever possible! After coming back from Berlin, I have been implementing the new typed array methods, and the plan is to continue tackling them one at a time. Apart from my occassional announcements (and rants) on Twitter, you can also follow the overall progress by subscribing to issue #3578 in the V8 bug tracker. Last but not least, a mention to the folks at Bloomberg, who are sponsoring our ongoing work implementing ES6 features. It is great that they are able to invest in improving the web platform not just for themselves, but for everybody else as well. Thanks!